Glass tile is easily one of our most popular tile choices. It's perfect for a kitchen backsplash or bathroom tile wall. It's natural luminescense opens up a room and the variety of colors make a beautiful design impact. It's also durable and easy to clean. That's a lot to like! Wondering what else you can do with glass tile? Kermans tile store in Indianapolis has a few creative ideas for you. Instead of brick, consider a glass tile surround for your fireplace hearth. Practically speaking glass tile is great because it doesn't stain, is easy to clean and is very durable. It's also a beautiful choice because the glass tile reflects the light adding more warmth and magic to your fireplace. Glass tile has long been a popular feature in pool accents. 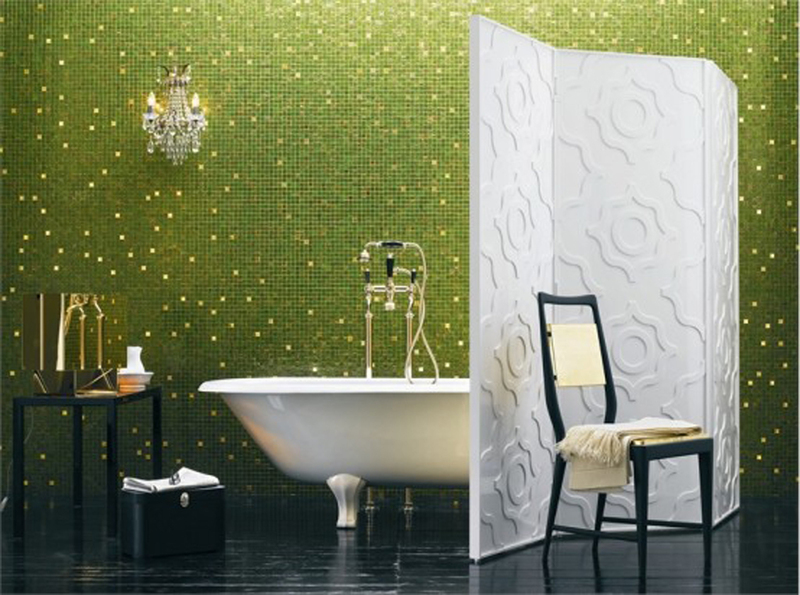 The tile catches sunlight and adds a sparkle that can't be beat. Why stop with an accent? Consider adding a tile mosaic to the floor or walls of your pool - or even cover the walls and floor completely with tile for a beautiful effect. Glass is a popular choice outdoors because of how nicely it reflects light but it also withstands elements well making it a practical element in a water feature, fountain, water wall or in an outdoor kitchen. You have an amazing array of color choices and tile sizes to create mosaics for these elements. Learn more about glass tile. Speaking of colors and sizes... glass tile is really a work of art when assembled in a mosaic. Consider adding a large mosaic element as artwork in your dining room or living room. Or expand beyond the backsplash in your bathroom to add an accent wall. The glass tile looks beautiful and maximizes the light in the room. Natural colors from dusky purples to mossy greens. Vibrant colors such as lemon yellow or bold red. Neutrals such as tan or brown. The choices are practically endless. Having a hard time finding the right headboard for your bedroom? Why not install one directly on the wall? A glass tile headboard is a fantastic design element that can work with numerous design stles. A smooth, cool surface in contrast with your warm, comfortable bed creates a stunning bedroom. Ready to add glass tile to your home? Stop by Kermans Indianapolis tile store and ask to see our selection. Our in-house designers - free for all Kermans customers - will help you select the perfect tile for any application from standard backsplash to creative bedroom headboard.